It’s a stark reality: The cost of most types of long-term care services continues to rise at a rate outpacing inflation. Genworth’s 11th annual Cost of Care Survey highlights the fact that the increasing cost of long-term care is a serious and growing social issue and that consumers must be educated about that issue. It’s imperative that insurance advisors understand the issue so that they properly engage their clients on the topic. 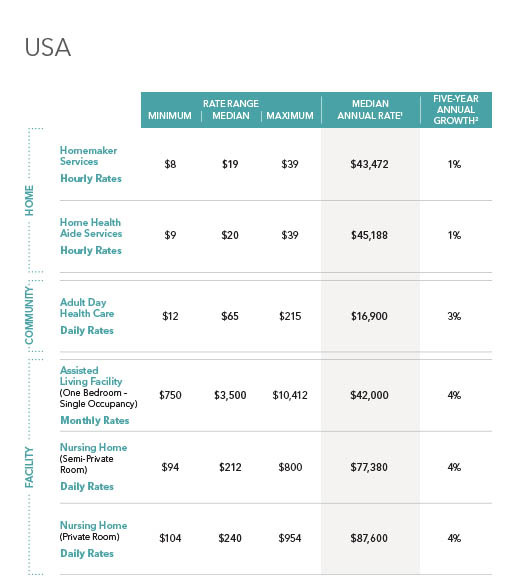 Nationally, the median hourly cost for the services of a homemaker or home health aide hired from a home care agency is $19 and $19.75 respectively. Homemaker costs have risen 1.2 percent on average over the past five years. Home health aide services have risen, on average, 1.32 percent annually over the past five years. The rate of cost inflation for home care services is rising at a slower pace than that for other types of services. This is relatively good news for consumers in that almost three-quarters of those who require long-term care prefer to receive care in their homes, according to Genworth’s claims data. The cost to receive care in an assisted living facility or nursing home is rising at a level three times greater than that of home care. The median annual cost for care in an assisted living facility is $42,000. This represents an increase of 4.29 percent over the past five years. The comparable cost for a private nursing home room is $87,600, which has increased 4.19 percent annually over the past five years. According to the U.S. Department of Health and Human Services, 70 percent of people over the age of 65 will need some type of long-term care services and support during their lifetime. If your clients’ savings were to be eaten away by care services 20 years from now, how would that impact your advice to them today? A combination of economic and market factors is driving the increase in long-term care costs. As a result, these associated costs are being passed along to consumers. The average long-term care claim duration is about three years, according to Genworth’s claims experience. Assuming one would receive in-home care from a home health aide for this length of time, the cost of care would be nearly $136,000. In an assisted living facility, this cost would approach $143,000. In a private nursing home room, this cost would exceed $260,000. At a 3 percent inflation rate, in 25 years, when many baby boomers could require long-term care services, costs for an average length stay in a private nursing home facility will be about $840,000. This is a steep cost that most Americans cannot afford. In addition to what type of care your clients choose to receive, the cost of care and the rate at which costs increase year over year can vary dramatically depending on where your clients plan to receive care. For example, in Boston and its surrounding suburbs, the median annual cost for care in an assisted living facility is $73,950, significantly higher than the national median cost of $42,000. Costs in this market also are rising much faster than they are nationally. On the other hand, in Las Vegas, one can expect to pay $33,000 annually for similar services, well below the national median. And, in Las Vegas, costs have actually declined slightly year over year. The impact of this cost differential over a three-year period – the average duration of a long-term care claim – can be significant. In Boston, a three-year stay in an assisted living facility would exceed $221,000. In Las Vegas, the comparable cost would be just under $100,000. As such, long-term care planning must take into account these regional cost differences in order to be of value to clients. However, long-term care planning is about more than just cost. It requires difficult family decisions and sacrifices. Planning today can help save consumers from facing a crisis tomorrow. It is important for customers to know that having the right talk, the right way, at the right time, can help ease the emotional, financial and legal pressures of planning for long-term care needs. As a trusted advisor, you can help your clients recognize the importance of sound planning and encourage them to take steps toward putting a plan in place. Here are some tips to address the impending social issues surrounding long-term care. Genworth’s Cost of Care Map can help you and your clients evaluate options to address the increasing cost of long-term care and put together a comprehensive long-term care plan. The map provides cost of care information for nearly 450 regions nationally, so that you and your clients are able to develop a plan tailored to the specific market in which they expect to receive care. Wendy Boglioli is Genworth’s national spokesperson. An Olympic medalist in swimming, she has spent 10 years in the long-term care field. Wendy may be contacted at wendy.boglioli@innfeedback.com.